A low pressure trough is beginning to dip off of the Pacific Ocean and into California this morning, this is the piece of energy that will affect Colorado throughout the day Thursday, into Friday and even early Saturday. While this isn’t a particularly strong storm system it will bring much needed moisture to many areas of the state. We say “much needed” because statistically it has been very dry in many areas of Colorado during April. Despite our wet period earlier in the month, much of the state remains in some type of drought status. Latest model guidance has snow for many areas above 7,000 to 8,000 feet in elevation. 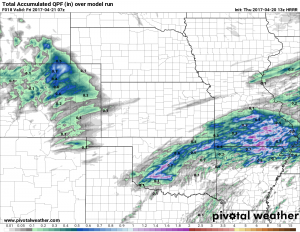 This means the front range foothills and the highest elevations of the Palmer Divide have a chance for snow accumulation. Areas below 7,000 feet may see a snow flurry here and there, but temperatures will remain much too warm for any snow to accumulate. 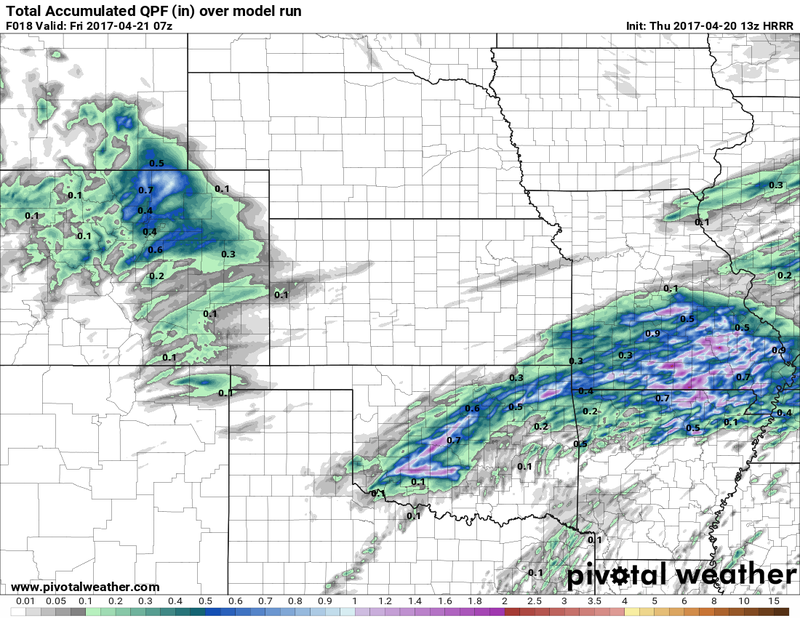 Interestingly there is a bit of model disagreement on who sees the most rain out of this storm system, the NAM has the Palmer Divide region seeing about 0.2 to 0.4 inches of precipitation but the HRRR shown above has us in the 0.5 to 0.7 range. Why is this? One word: thunderstorms! 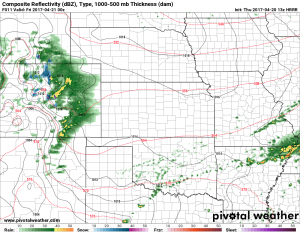 Any areas that get stuck between a thunderstorm will see higher amounts of rain, the NAM doesn’t see thunderstorms along the Palmer Divide but the HRRR does! 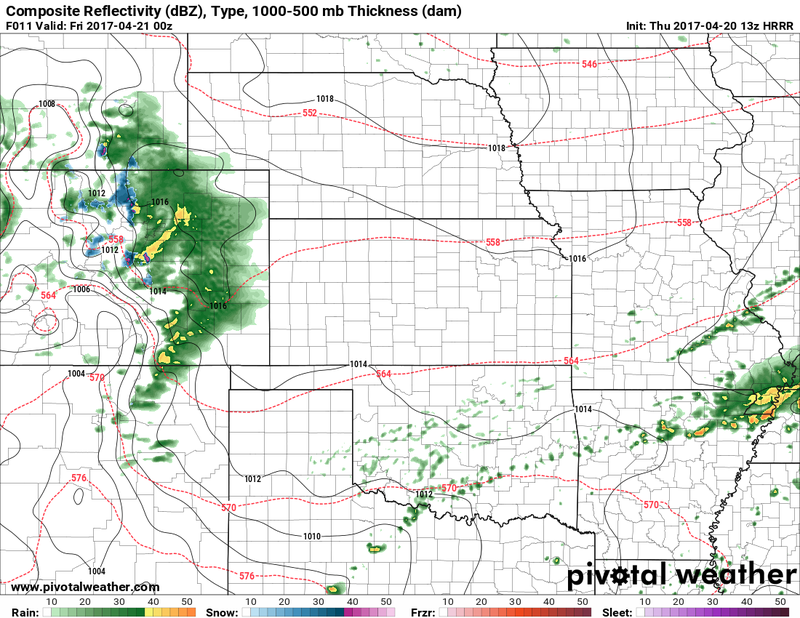 The HRRR shows a decent chance of rain and thunderstorms after about 12-1PM timeframe. It then has continued chances of rain and storms lasting through about 9PM, but not all areas will see these storms. They look to be scattered at this time. Areas over and near Monument hill may see a bit less rain accumulation. Some areas with higher elevations may see some snow accumulate, mainly over 7,000 feet in elevation. Snow accumulations will be light, in the 0-2 inch range total. Winds could be gusty Thursday afternoon and evening as the main energy of the storm system begins to move in. Expect a soggy Thursday evening commute for some areas. This should fall mainly as rain and snow is not expected to impact the commute. Cooler temperatures combined with wind and rain will make it feel chilly out, keep that in mind if you have outdoor activities!